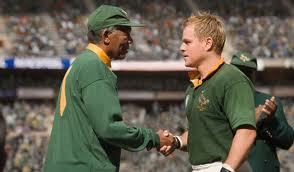 Invictus, the powerfully feel-good inspirational movie that introduces a whole new generation to Nelson Mandela, downright depressed me. And not because S. Africa won mind you; I have no allegiance to the All Black’s of New Zealand. Though completely unfamiliar with the story, one cannot help but be impressed and motivated by Clint Eastwood’s telling of how rugby of all sports united a fragmented country. The movie answers the cultural question of why sports matter. The source of my sadness emanates from Invictus’ memory jarring tackle of post-cold war beliefs in the betterment of our world’s future. Speaking generally, from the fall of the Berlin Wall to 911, the view of most included the notion that disputes and conflicts were on the decline with an uptick in living standards in the conflicted arenas of the 24/7 news cycle. Far from perfect but nonetheless hopeful. Even tremendous miscues in the former Yugoslavia produced resolutions most consider positive. The early to mid-90’s felt as though the world had a clean slate on which almost any kind of change was possible. I mean why not? We had just seen the USSR become lowly Russia, apartheid end, and technology enter our lives bringing it all closer. Juxtapose Invictus however, to other inspirational films such as Chariots of Fire, Schindler’s List and To Kill a Mockingbird; the difference being that the audience understands that the world is better than the time period depicted. Though retaining its democracy, not a small thing in Africa, S. Africa has not fulfilled the hopes and dreams resembled by the story of the Green & Gold. Extraordinarily high unemployment, high crime, corrupt government officials and reckless disregard for the AIDS crisis give longing for Mandela and his Bok’s. The same goes for the rest of the world with almost every corner less safe and prosperous now than 15 years ago. Be it parts of the Middle East, Africa, South Asia, S. America, Mexico, or FSU countries, hope is gone or at least stagnate. As is usually the case, seeds of sorrow are planted long before the grapes of glory die. We can point to the failure to militarily respond quickly to the Iranian takeover of the US Embassy in 1979, the homophobic ignorance of the AIDS crisis in the early 80’s, the arms-for-hostages deal in the mid-80’s, letting China off the hook for Tiananmen Square in 1989, misunderstanding Russia, repealing financial protections, and the slowness in dealing with the Bosnia-Herzegovina genocide in the early 90’s, ditto Rwanda, Darfur as just some examples of why today seems less safe than yesterday. Of course, maybe we were just too optimistic back then; gleeful at the vanquishing of a half century’s enemy and ready to adjust to the shrinking world. Then again, sometimes opportunity just knocks. Let’s just make sure next time we have a really loud doorbell.